The soldiers (1965), considered in its day 'unrepresentable' for its complexity, demand and monumentality, It is a landmark in the history of twentieth-century opera and a huge challenge for a theater. The Royal Theatre will offer 7 Opera functions between days 16 May and 3 of June, in a new production originally created by the Opera de Zúrich (September 2013) and the Komische Oper de Berlín (June and July 2014). Scene address calixto Bieito not hide or disguise the harshness and violence of the opera, confronting the viewer with the senselessness, abjection, the horror and despair extolling wartime. Pablo Heras-Casado It will be responsible for the musical direction of the very difficult score, written for 16 singers, 10 actors, dancers, choir, an orchestra with more than 100 ─ which it includes musicians and jazz band 13 percusionistas─, In addition to using chairs and tables as percussion, magnetic stripe, Sounds of War, projections, etc. The Titular Orchestra of the Teatro Real It ─con characterized as musicians and soldiers wielding their instruments like armas─ play at center stage, with the performers acting on the moat, near the public. In the ensemble cast of The soldiers It emphasizes the leading quartet with soprano Susanne Elmark (Marie), baritone Leigh Melrose (Stolz), the bass Pavel Daniluk (Wesener) and tenors Uwe Stickert Y Martin Koch, which turns on the interpretation of Desportes. The 7 functions The soldiers They will alternate with 5 representations Street Scene, two operas that explore, from times, spaces and very different languages, the brutality of gender violence. Inabarcable to deepen the musical and metaphysical richness of The soldiers, ─ there will be a colloquiumEnfoques─ he 9 of May, a lecture on the opera, he 11 of May, and brief presentation of the production, Prior to each function, Hand José Luis Téllez, also available online. Functions The soldiers They are sponsored by the BBV FoundationA. The premiere in Spain, the next 16 of May, from The soldiers, from Bernd Alois Zimmermann (1918-1970), coinciding with the anniversary of the composer is, definitely, one of the great landmarks of programming Bicentenary of the Royal Theatre. Released in Cologne 1965, after a long and troubled gestation ─ and several adjustments to make viable the interpretation of the partitura─, The soldiers It has since become a benchmark in the history of opera, although the vast means needed to put on stage each new production become an artistic event. Bernd Alois Zimmermann, that nation Bliesheim, Colonia, in 1918 within a bourgeois deeply Catholic family, He was forced to enlist in the army 21 years to participate in the Second World War, from which he emerged with lungs full of lead and deranged mind. Su brief and intense carrera, suicide truncated by the 52 years, It developed in the turbulent times of war, when Europe, lacerated, He is trying to heal the wounds with walls and iron curtains. Based on the work The soldiers, the visionary writer Jakob Lenz (1751-1792), champion of the Romantic movement storm and stress (Storm and momentum), Zimmermann uses the path of destruction of Marie, soldiers become a homeless prostitute, as a metaphor for moral and ethical degeneration of humanity to cross the threshold of endurance and the expressible: a terrifying journey to the darkest corners of the human being, inhabited by a monster that is excited with the perversity and rejoices with pain. The soldiers rupturistas drinks from the musical currents of the second half of last century, Polarized in Darmstadt, but also of Western musical tradition, jazz, del pop, Of the radio, film and the technical possibilities offered direct recording and sound processing. All that realizes The soldiers, a colossal 'collage' vertical and horizontal, Performing multiple layers, that part of a structure 12 notes (serialismo) structured by ─chacona recognizable musical forms, chopped, to research, nocturno─ associated with each of the 15 scenes and fed by an unlimited universe of sound, It is incorporating from Bach chorale and jazz rhythms to the sound of bombs and shrill cries of agony. This radical and incomprehensible opera, classical theater that transcends boundaries weather ─las past scenes superimpose, present and futuro─; from place ─con actions (Up To Eleven!) simultaneous in different espacios─; and action ─con narrative drive permanent disintegration and recomposición─; He arrives at the Royal Theater in stark production conceived by calixto Bieito and released a huge impact on the Zurich Opera House in 2013. 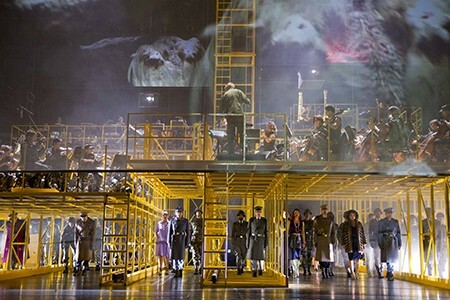 Based on the guidelines Zimmermann, It is urging the orchestra and performers put on a central stage surrounded by the audience, Bieito placed the orchestra in the center of the scene, in an installation designed by scenographer Rebecca Ringst simulating a barracks where musicians 'armed' with their instruments are partakers of barbarism. The public is summoned to contemplate scenes of barracks and attacks that are articulated and mingle with familiar staccato dialogue and vacuous military talks by screams and gunshots sprayed, in a mosaic painstakingly constructed with bursts of lives intertwined in a spiral leading inexorably into the abyss and stupor. Two hours of hard reality translocated to the stage: art not to die of truth. The soldiers It was finally released in Spain, 53 years after its creation, without losing its cathartic strength and a disturbing today.